Watford 25 twilight around Watford & a selection of withdrawn 25's. '25 twilight around Watford' From the photographic files of Ian Hammond. Its a hazy July 5th 1985 and the slumbers of Watford are disturbed by the passing of 25059 hauling the 1A88 Hemel Hempstead - Euston parcels. This would be the last Class 25/1 in service, albeit of an unusual nature dragging three locomotives from Buxton to Crewe. This locomotive was eventually to reach preservation. A fine view of 25034 passing Watford with the 8T81 Willesden - Liddlington Tip on a very damp looking April 3rd 1986. This locomotive would not see the year out, being withdrawn from Crewe on December 22nd 1986. An extremely dull day at Watford Yard sometime during 1986 reveals a rather grimy 25035 carrying out a local duty. Class 25's were regular visitors to the southern end of the WCML right up until their final demise. An interesting assortment of vehicles surround 25044 at Watford Yard on a misty May 25th 1985. 25044 ended its days two months later, finally being broken up at Doncaster in July 1986. Yet another dull day brings three views of 25057 & 25145 stopped at Watford Jct on the local 8L90 loaded ballast job. 25057 clearly is in need of some cosmetic bodywork attention, though the chances of that happening this late in its working career are virtually nil. 25145 would have the dubious distinction of being the first locomotive withdrawn in 1986, ending its days at Vic Berry's yard, 25057 was more fortunate, being one of those to reach preservation. The running lines in these views were closed due to an engineering possesion, the photographer being part of the staff involved in the possesion. On a bright & sunny August 13th 1986 25057 cruises through Watford with the 6A74 Wolverton - Willesden. The Type 2's played an important part in keeping all of the overhead wires in good order, probably a weekend never went by without an ohle maintainence train, Class 25 hauled of course, being present somewhere on the WCML. A damp and overcast April 16th 1986 finds the unmistakeable 25095 heading towards Willesden with the 8T81 empties from Liddlington Tip. 25095 ended its days in the stack at Vic Berry's, its unique cab front livery providing no doubt as to which 25 in the stack it was! A fine study of 25145 as it works busily in Watford Yard on a still misty May 25th 1985. 25145 had seven more months of service, its last shed was Carlisle. The day of the launch of Network South-East finds 25181 bringing freshly repainted 51659, 59763, 59727 & 51889 through Watford. This locomotive would have the misfortune to fail on a railtour to the south coast and would become the only Class 25 to be broken up at Eastleigh depot. 25190 propels ex LNWR ambulance coach #8898 through Watford Jct on July 26th 1986. 25190 would see service into 1987 being withdrawn on January 28th 1987. With the new station taking shape in the background 25195 marshals its train on April 21st 1985. Only two months remain for 25195, withdrawn in June it would surrender its power unit to 25205 and its bogies to 25262. 25231 & 31298 wait to leave Watford Yard with the 8L62 local job on February 24th 1985. This type of combination became a common sight as the Class 25's were replaced by the Class 31's. As an express heads towards the capital on April 19th 1986 the 0Z17 Bescot - Willesden with 31326, 31285, 25244 &, 25265 also head south at a more sedate rate, presumably to allow the 31's the opportunity to complete the journey without falling apart. A panoramic view of Watford Jct as 25313 heads south with the 7O77 Tring - Southampton cement. 25313 would survive until the end, being one of the lucky ones to reach preservation. The 7L69 Willesden - Bletchley freight of March 18th 1985 with 25315 in charge hurries through Watford Junction station, rattling windows & blowing papers about until all that remains is singing CWR and a fading 6LDA28B. 25323 works the local job T78 on December 14th 1985. Another Class 25 to last into March 1987 25323 was not so fortunate as others featured here - Vic Berry put an end to it in October 1987. A wonderful sunny May 28th 1985 finds 25324 in Watford Yard ready to work target 78. Christmas Eve 1985 proved to be the end for 25324, being withdrawn at nearby Willesden and remaining there until February 1986. Type 4's normally found at the south end of the WCML would be Class 47's, but here a test train of new MkIII coaches heads south on July 5th 1985 behind 45148. The first ten Peaks were regular visitors to Euston when new, though considerably outnumbered by the many Class 40's used in the early days of the diesels on the WCML. On a miserable wet June 4th 1985 25196 keeps company with 08909 at Bletchley depot, no use for the miniature snowplougs on this day! One of the more lasting errors made by BR in the 1960's, is featured here, Bletchley flyover, designed for traffic flows that never materialised. Seen here with 25236 on a freight from Aylesbury, March 28th 1984. 25034 presents a striking pose at Northampton Yard on a sunny day during 1985. It still bears indicators of its time in Scotland, the position of the numbers and location of the blue star coupling codes. The hinged ventilators indicate this machine is dual braked. And what does the fitting of the new sandbox indicate? A work stained 25051 keeps company with a variety of locomotives including 20002 at Bescot Holding sidings on May 6th 1985. 25173 is a little off the beaten track by the time this view is taken of it at Bristol on March 7th 1986. Its lunch time on March 11th 1987 and the working careers of the remaining Class 25's can now be measured in days. Here 25278 heads towards Stoke with a short freight. Soon almost three decades of familiar burblings from the Derby Type 2's in revenue earning service will be but a memory. 25296 enters Crewe Depot on August 4th 1985, clearly the beginnings of another fine sunny summers day, somewhere. Despite its workworn plain blue & yellow livery 25296 reveals in the details that its last shopping was at Glasgow. Although in the final years the Type 2's were all allocated to the LMR they remained very active in the Scottish Region, made possible by the use of Carlisle drivers with their route knowledge north of the border. Here 25910 & 25903 keep company with 26015 at Motherwell on August 16th 1986. Yet another damp day strikes Saltley depot, where long time withdrawn resident 25027 keeps company with 58017, 56129 & 45036 on January 29th 1985. Long time withdrawn residents of Glasgow Works, 25028 & 25318 slowly fall apart as they spend a great length of time at the Works. 25028 spent over seven years withdrawn, at Millerhill, Polmadie, Glasgow Works, Thornton Jct & finally Leicester. 25064 & 40118 keep company at Crewe Depot on February 23rd 1986. 25064 was withdrawn in December 1985, and appears in this view to have already surrendered some parts. Eleven Class 25's (no doubt many more out of sight), with 25123 the nearest, fill the viewfinder at Swindon North Yard on July 4th 1986. In a clear out of Glasgow Works's wrecks a move was made to Thornton Jct for the six machines seen here (25160/046, 26013, 25028/318 & 27016). It was intended for Vic Berry to scrap them on the spot but asbestos issues eventually saw most of the locomotives moved to Leicester for disposal. Withdrawn 25196 has already begun to surrender parts to keep the ever dwindling fleet of Class 25's operational, seen here at Crewe Depot on May 11th 1986. Despite its once sizeable fleet of Class 25's Toton did not harbour many withdrawn examples for very long, after spares removal most went quickly on their way to Swindon or Leicester. Seen here is 25209 with 45074, 25032 & 45069 on October 11th 1986. Being a time consuming item to cut up the cabs frequently remained long after the locomotives are gone. At Doncaster Works on May 11th 1986 are the cabs from 25210 & 25237. An old favourite in the shape of 25224 comes to the end of the line, seen here after arrival at Crewe from Saltley, 47547 is parked behind, May 11th 1986. Its been many years since 25226 was outshopped new from Darlington, now standing forlorn at Crewe Depot on a damp August 4th 1985. It has a very pronounced droop to the cab, presumably this was the reason for its withdrawl two months earlier. Frequent trips from Derby to Crewe always ended with a scramble to identify the multitude of locomotives stabled on Crewe Depot. A withdrawn 25231 heads a long line of Class 08/25's, the rusty rails telling their own story that many of these machines only have one more trip to make. The various BREL workshops all had their own unique way of breaking up locomotives, here 25237 succumbs to the cutters at Doncaster sometime during April 1986. The depot doors are all closed to two of Darlington's finest - 25245 & 25226 - as yet another fine damp day runs its course at Crewe on August 4th 1985. Both were withdrawn in June, 25226 on 10th & 25245 on 30th. Swindon, the graveyard for many a life expired locomotive, does the coup-de-grace for 25253 on May 4th 1985 with the side panels cut away for access to the engine room. The foreground already contains some salvaged components, and some bits where bits are not meant to be. 25298 stands next to 20172 at Crewe on April 1st 1985. Apart from the missing window 25298 appears ready and able for its next duty, but it has been withdrawn for about a month, with only one more trip to make across the Pennines to Doncaster for breaking, it would be the last class 25 broken up at Doncaster. Maybe not withdrawn, but certainly no longer in revenue earning service, 97201 & 97403 are graced with a light snowfall at the Research Center, Derby on December 15th 1986. The following comes from Ian's notes at a time when he was the train recorder at Watford powerbox. It reveals what could happen when the normal electric service was interrupted by a loss of power! Enjoy! I was working as the box lad (train recorder) at Watford Power Box on the 20th December 1983 when just before my 0600hrs to 1400hrs shift started a southbound Freightliner pulled the overhead wires down at Bourne End just north of Hemel Hempstead. The result meant all trains had to travel via the slow lines from Watford to Tring and had to be diesel hauled! - I spent a busy morning making lots of tea for all the bosses who were about, numerous runs to the butty shop! and loads of time with my head out of the box window wishing I was on "that" train as it passed with a class 25 on the front! I remember the box supervisor convinced me to go home just after 1500hrs but after a bike ride home in the freezing cold and a quick sandwich I was back again to grab the evening peak, all diesel hauled of course and remember I was brought up in Hertfordshire on electric units and not much else! - I called into the Power Box and the late turn box supervisor promptly ridiculed me in front of our regional inspector saying " this boy has not got a home to go to - I only sent him home 2 hours ago and he's back again !! " So off I went to ride some trains, however the late turn box lad asked if I could come back so I could help out later and allow him to get home, so I only managed a few trips, how I wished I'd would have stopped out a bit longer. So I returned to the Power Box, still as hectic as ever as all the night freights were being let out of Willesden and the diesels were now coming off most of the southbound passengers trains at Watford as motive power was getting a bit short on the ground. Here is a log of my day - the first section details passing times of trains at Watford Jct. (At this time Cricklewood was just about to loose its fleet of Class 25's, the transition to the Class 31's was slower than anticipated so at the time of this article the makeup of the 25/31 locomotives in the London area was about 50/50 - although in this article clearly anything that strayed into the area was going to be used. I Departed Hemel Hempstead on 2L49 Euston to Bletchley service made up of 310052 being hauled by 25258 and passed 25315 on the Bletchley wiring train at Bourne End. The following is another report of the happenings that occurred on December 20th & 21st 1983 following the dewirement referred to above. This text is pretty much as delivered to me from Nick Ross, I've not cross checked the two reports for the comparative details of the workings, so if there are any discrepancies don't worry about them, just enjoy the variety of traction that BR had available when such an event happened! And thanks to Nick and Ian for recording the workings! To a few of us local bashers Christmas came a few days early with a 36 hour "drag" courtesy of a serious wires down incident in the Bourne End area. Before joining the bus to work there was just time to survey the chaos at Leighton station. The 0700 Euston commuters had been waiting a good 40 minutes for a train and were growing restless like penguins do. Eventually an already wedged 8 car Marylebone DMU set arrived and on they plied. One girly penguin was unable to get on so Railman Trevor put her in the second man's seat of the middle DMU and told her "not to touch anything". A container cover on an overnight diesel hauled liners (4E73) had come loose and brought down a long section (several miles) of the DS wires from Hemel to Tring. The Bourne End (nr Hemel) had also been blitzed which meant there was no OLE on any tracks between Hemel and Tring for the morning peak. I begrudgingly left the chaos and went to work but a quick afternoon holiday booking saw me back around 1400 to join 310068 on a Rugby-Tring additional for a bus forward. We crossed nothing on a strangely empty main line. At Tring we arrived in the rare up bay/loop platform. A few normals joined the waiting bus but I joined the Marylebone set (51658/59750/59731/51663/51666/59753/59654/51609) seen that morning in the opposite platform. In true basher tradition I sat in the front DMU coach and so was totally out of position as 47314 dragging 87014 arrived on an up drag and stopped at a red peg on the UF. The secondman got out and phone in hand gestured for the "seven" to drop it's pan and was away before I could leap over the bridge for it. Our DMU followed the "big duff" crossing over to the UF and tottered along passing several miles of overhead lying between the DS tracks! "Sparkies" were working away but this looked a long job. Wiring train power viewed was 31191 on the Willesden train, 25315 on the Bletchley train and 25032 on the Rugby train. At King's Langley we crossed a stopping Down DMU and this needed a second glance and photo as it was a 4 car rake made up of two withdrawn St Pancras-Bedford DMU's. These must have been dug out in a panic I thought and were unheard of in the Hemel area. A more regular (at weekends) Tyseley set followed then with a loud warning blast on the horn 31257 dragging another 87 passed us on the Watford curve. That was all that was on the move all the way to Euston. The terminus itself was equally eerie with just a few DMU's/310's and two rakes of Cobbler stock in. Two 47's were parked up on the stabling road where the "roarers" normally parked. Passengers and penguins milled around in the usual confusion that only serious farces bring. My DMU quickly left but then gen was obtained that some commuter trains would run plus a few Euston-Glasgow's. A 1600 Euston-Bletchley was then advised as departing from platform 12. I was pleased at seeing it was a hauled rake with a class 83 having brought in the 10 Mk I's in. The rake very quickly filled and with front coach seats bagged 25213 backed on! A very loud (no banker) attack on Camden Bank followed, some normals in the leading coach requested that the toplight windows be closed as they were unused to Sulzer music! Approaching the first stop, Watford I wondered whether to stay on board as the juice maybe restored but eventually opted to bail in nerd like fashion! Twenty minutes later the 1615 Euston-Northampton arrived with 25175 dragging 310�s 078/093. The packed 310�s had just emergency lighting to add to the atmosphere as it was now dark. The 310�s guard acknowledged the platform tip, rung his bell, the 310 driver blew his horn, the rat acknowledged and thrashed off into Watford tunnel.! Truly outrageous especially so on your doorstep! A Hemel bail saw 25251/25287 on an up Glasgow drag ease up to drop off a driver but no way could I leap on. So the Marylebone DMU was joined again returning me South. We crossed 25192 (not confirmed) on another Euston-Northampton Mk 1 turn whilst 47314 was just arriving at Watford on a Euston-Glasgow drag. I flagged off the �duff� and 47321 on the next Euston-Northampton Mk I turn. To me 25�s were much rarer than 47�s but I was beginning to question my decision when 47011 then appeared on another Northbound drag. For once patience paid off, 25287 (dud) had been split from the pairing at Euston and was dragging two 310�s to Northampton. I flagged this too and as hoped for 25251 returned on a Euston-Rugby Mk I rake twenty long minutes later. I bailed at Hemel to await the next drag but the station staff here told me the bad news that �there were no more trains� and I was put on a bus to Tring. As I got on 310058 sitting in Tring loop 25226 briefly stopped dragging 87033 on another Glasgow-Euston but this too was flagged as it was getting late. On the US just North of Tring a light 40058 was checked waiting for us to clear�.did this drag as well???? 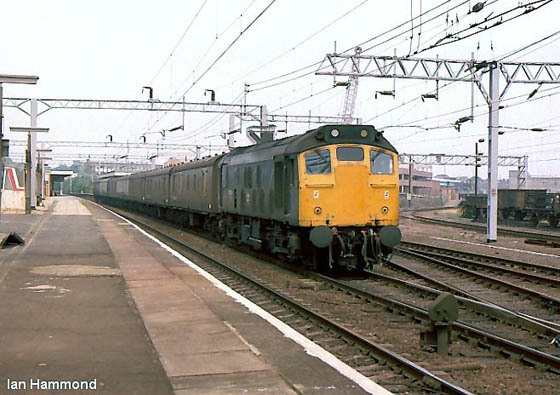 My flat in Leighton at the time overlooked the WCML and sleep was difficult as it was non stop class 25 thrash as Bletchley men and loco�s kept the West Coast moving. The drags continued throughout the night with rats on virtually everything. BY train crews were raking in the overtime, �Bletchley�s finest hour�. I got down the station just after 6am and was pleased to be advised the juice was still off in the problem section. 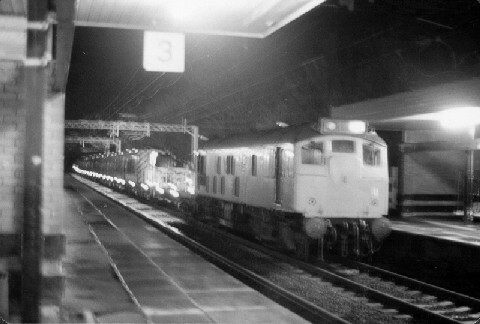 The silence was shattered by 25193 and the rare 25109 storming South on a sleeper/night rider service. A 310 arrived from Tring and was taken to M. Keynes. This was my first dud move of the day, as unbeknown to me, the hauled G06 Euston-Birmingham turn was running and called at Leighton. The drag power to Bletchley was 47314, this loco having done more passenger turns in the last 24 hours than in the whole of 83� .Anyway I viewed it heading North l/e at the Keynes apparently returning to it�s booked oil train duties from Bedworth to Immingham. The penguins hovered and we were all rewarded with 25236/25199 dragging 87008 on a Wolves-Euston calling all big shacks. A pathetic 3.19 miles were taken for a Bletchley bail. About 10 minutes later 47340 arrived on a Northampton-Euston Mk 1 turn which I did back to Leighton. Then unfortunately it was off to work. The power remained off till mid morning and even 56041 off the Stoke Gifford-Wolverton stone train was hijacked on Bletchley flyover and �borrowed� for a few drags�Power was restored around 1100 , it then failed again, but all was back to normal by 1300. * specific train times are not confirmed as an emergency timetable was in operation and kept changing all the time but I wasn�t complaining! 25032 at Hemel Hempstead with the wiring train on that unforgettable day, December 20th 1983. The platform was littered with broken insulator pots from the overnight dewirement. Afraid its a hand held night shot, Nick's comment!